Welcome to Dill Pickle Gear! Randonneuring season is coming up, design your new bag now! Or, check out our current stock! At first glance, Dill Pickle Gear bags look a lot like any number of other bags out there. Yes, they're made by hand in the USA, they look nice, and they come in any color you want, but a closer look reveals what's unique in ways that really matter. For starters, the bags are designed from the ground up to keep rain out. 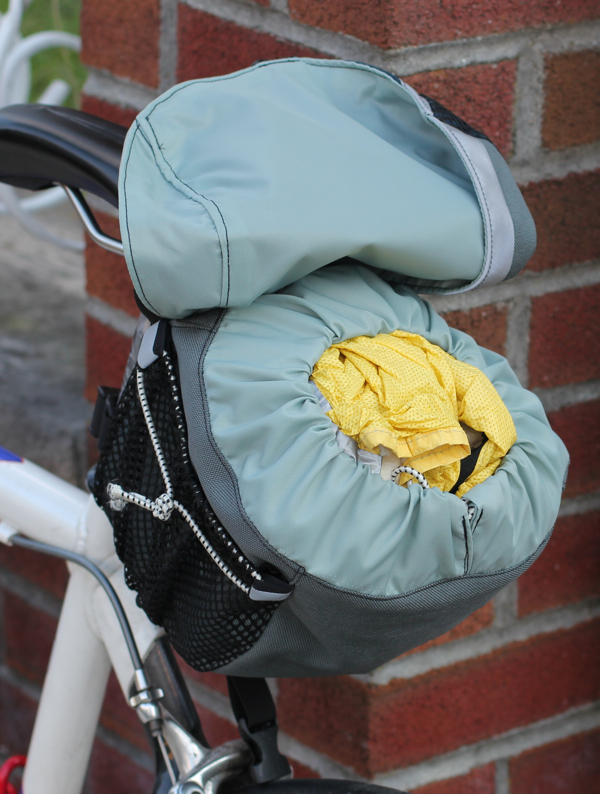 Rather than relying solely on a single layer of water resistant material, Dill Pickle Gear bags have a shell made from urethane-coated Cordua nylon and a separate "floating" lining, also made of a waterproof coated nylon packcloth. That means that even if the seams seep in the outer layer, any moisture still has to get through the inner lining. The generous side panels on the lids mean that the lid overlaps the bag's opening substantially on all sides to further shed water coming down from above. Seams, webbing, and buckles on the lid are sewn only through the outer layer, still leaving an undisturbed lining layer to cover the opening of the bag. 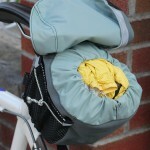 Dill Pickle Gear bags are also built to last. The materials used are sturdy and reliable and will retain their water resistance for years of use, while being much lighter in weight than the traditional waxed canvas and leather trim. And the zipper in the lining makes it easier to repair any small tears or holes properly from the inside between the two layers. 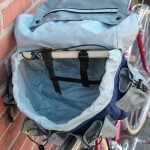 While the basic concepts are relatively simple, the exact shapes of the bags have been carefully designed to optimize the structure, stability, and usability of the bags: The Large Saddlebag has its opening tipped upward compared to many similar bags to help keep stuff from spilling when you open it. 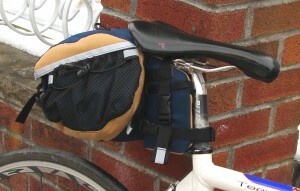 The Handlebar Bag has a unique trapezoidal shape that keeps it out of the way of your hands on the tops of the bars, and its curved bottom and flat sides take advantage of the structural characteristics of its internal plastic supports to keep its shape with minimal added weight. Dill Pickle Gear bags are designed to be versatile and adaptable so that they can work just as well with an off-the-shelf road bike as with a purpose-built traditional randonneuring bike. The Small and Medium saddlebags can mount to any saddle, whether it has built-in bag loops or not; the Handlebar Bag can mount to any bike with road brake levers; and none of them requires any tools or additional hardware. And that's just the beginning. Every detail is carefully thought out for a bag that performs well not only when you're packing it for the ride, but when you have to fish out your tools with cold fingers in the rain by the side of the road in the dark. 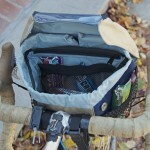 It's all those little things that add up to a great bag so you can have a great ride.